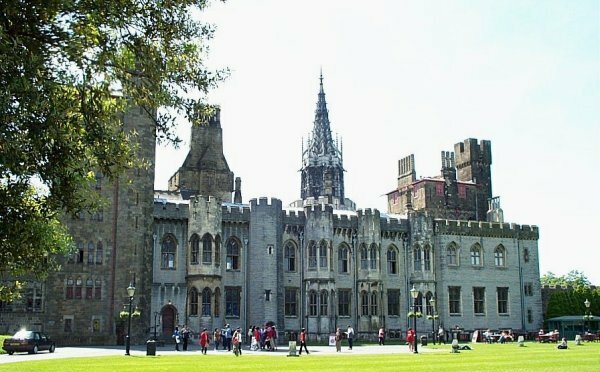 Cardiff Castle was the home of the Marquis of Bute and his family during the late Victorian period. 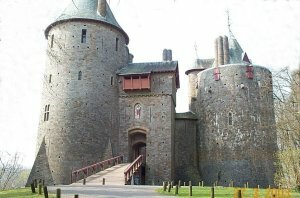 The castle buildings were extended in the 1870's with their architect William Burges adding the famous 150 feet high clock tower and further apartments all laviously decorated for Lord Bute. The bedroom of Lord Bute contains a magnificent Victorian bathroom complete with an adjoining toilet. 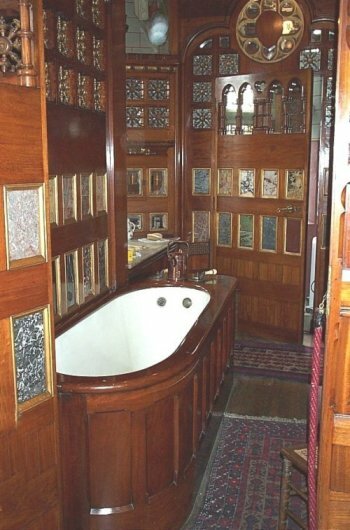 Lord Bute's bathroom located in the Bute Tower is a wonderful example of a highly decorated and timber panelled Victorian bathroom. 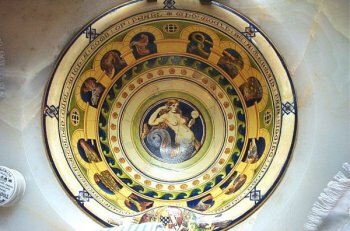 It is the only known example by William Burges the architect and dates from around 1870. 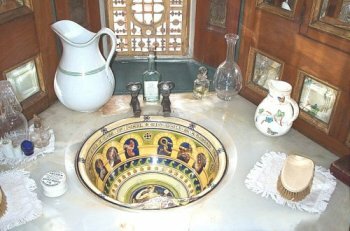 The bath is made from enamelled metal. 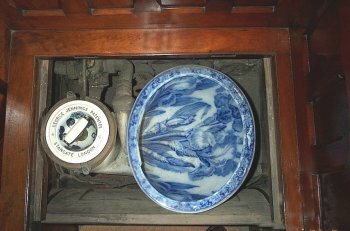 The water tank which feeds this bathroom is sited in the turret at the top of the Bute tower. 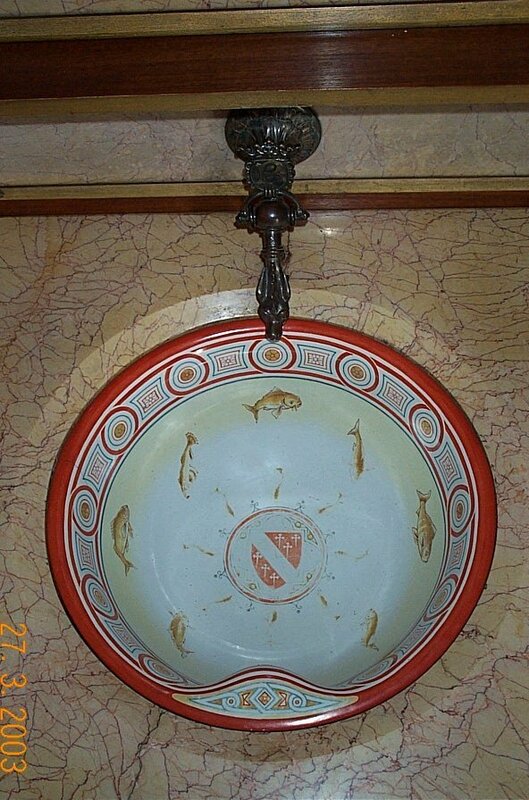 The beautifully decorated vanity style wash hand basin inset into the marble slab can just be seen at the top end of the bath. It is shown below in all its colourful splendour. 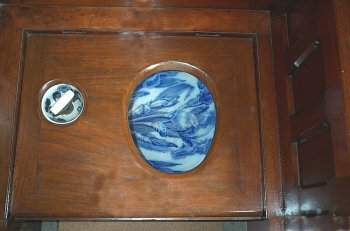 The toilet or lavatory with its water closet is located in the adjoining room which can only be entered from the bathroom. This was a particular requirement of Lord Bute. 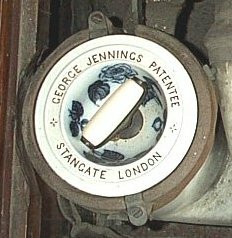 The WC pan and its flushing mechanism was manufactured by George Jennings of Stangate London for which he had taken out a patent.